When the eight-story Rana Plaza building fell apart at its seams on the morning of April 24, 2013, it took but a moment for the disaster to seal its place as one of worst in Bangladesh’s history. It would be weeks, however, before some of the world’s biggest apparel retailers and brands could determine their relationship, if any, to one or more of the garment factories housed there. The problem, it turned out, was transparency, or rather, the fashion industry’s lack thereof. Clothing supply chains, according to Fashion Revolution, a grassroots movement that rose from the tragedy’s aftermath, are notoriously complex, to the point of being opaque. Contrary to what you might expect, most fashion companies don’t own the factories where their clothes are produced, making it difficult to direct or monitor labor conditions. Complicating matters, a brand can place an order with a single supplier, only to have parts of it meted out among a number of small, unregulated “shadow” facilities, frequently without its knowledge. Transparency, Fashion Revolution says, is essential if businesses and governments are to be held culpable for what goes on behind the scenes. Working in partnership with Ethical Consumer, a magazine based in the United Kingdom, Fashion Revolution assigned scores to the brands based on their policies and commitments, the traceability of their supply chains, their audit frequencies and efforts at remediation when standards aren’t met, how they engage with stakeholders to address social and environmental issues, and the checks and balances within their own organizations to ensure that initiatives go forward as planned. H&M, Levi Strauss, and Inditex, which owns Zara, emerged at the top of the list for doing more than most other brands to communicate about their supply-chain practices. That’s not to say that the companies have fully transparent supply chains. “Whilst these companies should be congratulated for providing more information about their practices and products than most, there is a long way to go before any of the companies included in this Index will be able to fully answer #WhoMadeMyClothes,” Fashion Revolution said. Room for improvement? “More stakeholder engagement, better tracing of products down to sources of raw material, and even more transparent communications with the public,” the group noted. 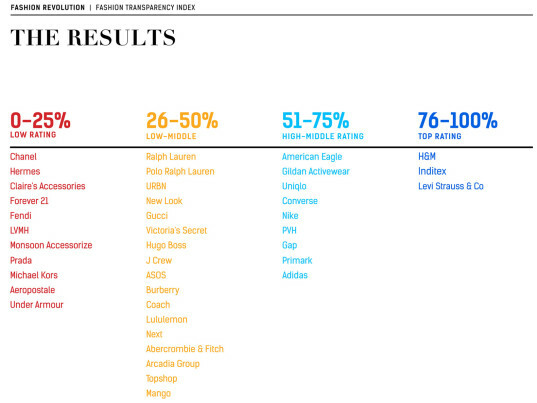 Scoring the lowest was Chanel, followed closely by Hermès, Claire’s, Forever 21, and Fendi. Fashion Revolution admits there are limitations to the broad-stroke approach it employed in its analysis. All 40 companies included in the Index were invited to fill out a survey, which helped the organization better understand their policies, activities, and communications. Because the group received only 10 replies, the other 30 companies had to be scored based on information publicly available on their websites and annual reports. 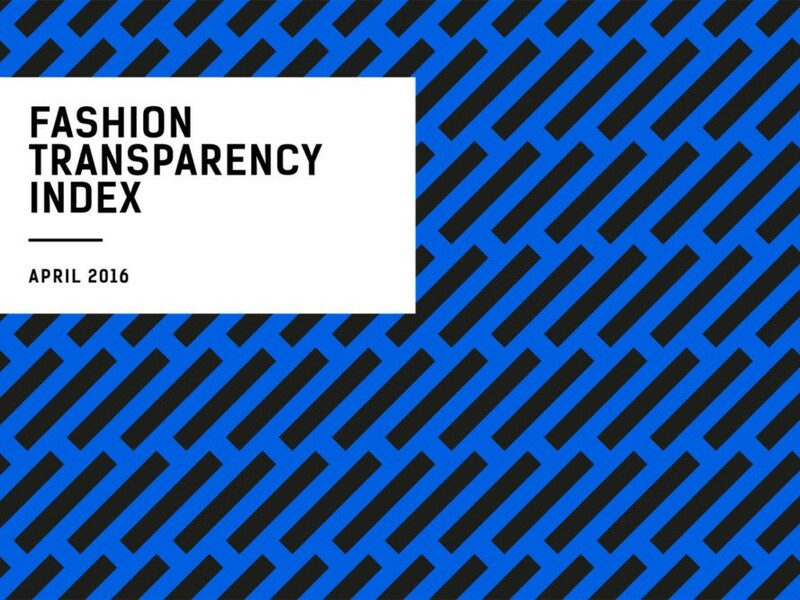 For next year’s Index, Fashion Revolution says it aims to include 100 brands and retailers. 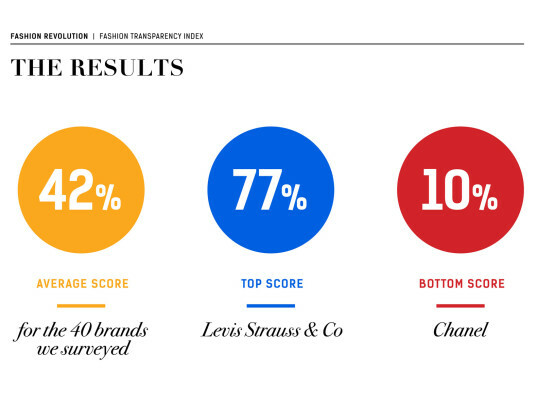 And if there’s a brand you would like to see on the Fashion Transparency Index, Fashion Revolution suggests getting in touch with them on the phone, through the mail, or using social media. 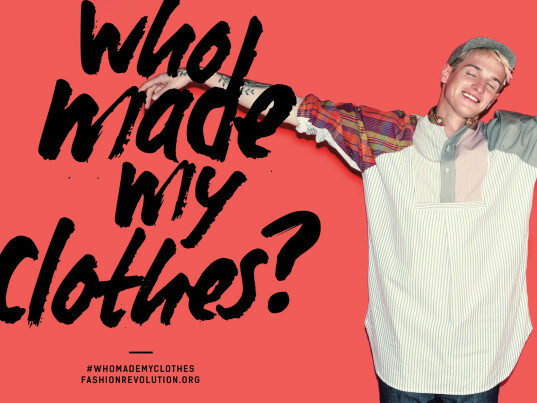 Just don’t forget to ask the single-most important question: #WhoMadeMyClothes? Although most companies have publicly available policies on environmental and labor standards, only Gap, Primark, and Levi Strauss appear to be looking to the future with long-range aims—2020 or beyond—that include defined end goals and quantified targets, as well as an explicit commitment to transparency. 40 percent of companies do not appear to have a system that monitors and continually improves labor standards, both at the board (e.g. an executive corporate responsibility committee) and department levels (e.g. a social responsibility team). Only five of the companies—Adidas, H&M, Levi Strauss, and Nike, which owns Converse—publish a list of all or the vast majority of their CMT (cut, make, trim) suppliers. 60 percent of the companies surveyed appear to be tracking their first-tier CMT suppliers but are not publishing this information publicly. Only two companies—Adidas and H&M—publish details of second-tier suppliers such as fabric and yarn mills and/or subcontractors. measures to monitor the more difficult issues in the supply chain, such as improving conditions for home-workers, eliminating forced labor, or eradicating Sumangali schemes (a form of child labor). Neither do they disclose in detail how they work with factories to remedy noncompliances. Only 11 companies show evidence of working with trade unions, civil society, or nonprofits on the ground in supplier countries to improve working conditions. H&M, Inditex, Levi Strauss, Primark, and PVH Group appear to be involved in the most multi-stakeholder initiatives. 30 percent of the companies surveyed do not appear to have whistleblowing or confidential compliant mechanisms. “This means that workers may have little chance to speak up about poor conditions or abuse, or may not be able to do so without fear of repercussion,” Fashion Revolution said. 53 percent of the companies surveyed either have little or nothing in place to monitor where their raw materials and components come from, or if they do, choose not to share this information publicly. 20 percent of the companies surveyed do not disclose how they work with non-compliant factories in order to improve conditions. Levi Strauss publishes the most information about its corrective action plans, Fashion Revolution noted. When the eight-story Rana Plaza building fell apart at its seams on the morning of April 24, 2013, it took but a moment for the disaster to seal its place as one of worst in Bangladesh's history. It would be weeks, however, before some of the world's biggest apparel retailers and brands could determine their relationship, if any, to one or more of the garment factories housed there. The problem, it turned out, was transparency, or rather, the fashion industry's lack thereof. Clothing supply chains, according to Fashion Revolution, a grassroots movement that rose from the tragedy's aftermath, are notoriously complex, to the point of being opaque. Contrary to what you might expect, most fashion companies don't own the factories where their clothes are produced, making it difficult to direct or monitor labor conditions. Complicating matters, a brand can place an order with a single supplier, only to have parts of it meted out among a number of small, unregulated �shadow� facilities, frequently without its knowledge.